My first book by this author and one I really enjoyed. It was a very different to what I expected story, but I soon fell in love with Liam and Mary, and the wonderful settings. Its beautifully described, I felt there in India with them in the heat and dust, seeing the markets, feeling the hustle and bustle of the country. The way the hotel staff are described, the way they tell Liam what they think he wants to hear, rather than the truth is perfect, and when people need their jobs, are unlikely to find others its a situation that’s happens the world over. He needs to see why the hotel is losing money, the staff just want to show him the good side, convince him they’re doing a wonderful job. Its so easy to picture it and his frustration. Then he spots Mary, lighting candles at her beautiful Lotus flower that’s blooming in the ruins of an old pool. 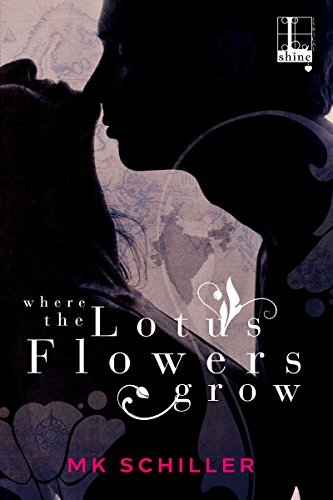 The flower, the Lotus tag, is echoed throughout the novel and made what seemed like very different parts join up – gave them a connection. Its not just a rich man, poor girl romance though, there’s so much more, some horrific tragedy in Mary’s past, so much that makes up this puzzle of a woman, well educated, multi lingual, working as a maid. Its very typical the way the hotel manager saw her as a woman and assumed she couldn’t speak English, assumed she was illiterate. We do judge on appearance and culture, and that was true for so many Indian ladies but not for Mary. She had her reasons for staying in the background but once she caught Liam’s eye circumstances threw them together, and they began a romance that Mary insisted was for while he was there only, that when he left that would be it. Of course emotions aren’t easily controlled and it was interesting reading how hard she fought hers, how Liam tried to convince himself she wasn’t more to him than a holiday romance. He’s got his own issues, his own difficult background and family problems, and the last thing he’s looking for is love. I really enjoyed the way they struggled against their feelings, and the dramas, the way they turned out, and how disparate things can actually be connected even if by very slight means. Its that Six degrees of separate thing. Fiction often seems far fetched, and yet real life does have these really odd coincidences. Looking back from the end its easy to see the trail that actually connected them, and how it was set in motion, Mary’s need for revenge led her to the one place Liam’s family circumstances took him to. They could easily have missed each other, but its strange how often circumstance places us in the right position. Is it fate, predestination or truly just chance – who knows? Stars: Five, a lovely story that made me think, made me feel there with the characters.